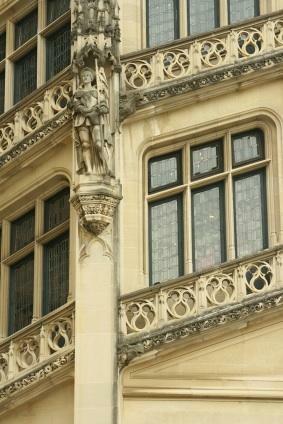 The Biltmore Estate, located in scenic Asheville, North Carolina, is America's largest privately-owned home. The 250-room mansion, designed to resemble a French chateau similar to Versailles, was built in 1895 by industrialist George Vanderbilt. It has been faithfully preserved as a monument to America's gilded age. It took more than 1,000 workers six years to complete the impressive Biltmore Estate. Its 250 rooms, spread over four acres of floor space, include 34 bedrooms, 43 baths, 65 fireplaces, and 3 kitchens. One of the largest rooms is the Banquet Hall, which is 72 feet long by 42 feet wide and boasts a 70-foot ceiling. The hall's massive dining table seats up to 64 guests. Other features of the house include a wood-paneled library with over 10,000 volumes, an indoor swimming pool, and a bowling alley. Surrounding the Biltmore mansion are 75 acres of manicured gardens, originally designed by Frederick Law Olmsted, best known as the designer of New York's Central Park. The garden contains over 2,300 roses and an amazing collection of more than 100 azaleas. The four-acre kitchen garden contains a wide array of culinary and medicinal plants in addition to a large greenhouse filled with tropical plants, like coffee and pineapple. Animals are also an important part of the estate. The historic Farm Village is home to chicks, ducks, goats, lambs, and gentle Belgian draft horses, among others. The horse barn houses stables, a blacksmith, and a 19th century woodworker. In the fall, the horses lead wagon rides for guests around the estate. The Biltmore Winery is the most visited winery in the United States. Housed in the original dairy barn, the award-winning winery produces over 15 varieties of wine, including Chenin Blanc, Sauvignon Blanc, and Chardonnay. All the grapes are handpicked and grown on the property. For a true Biltmore experience, visitors can stay at the four-star Inn on the Biltmore Estate premises. This French-style inn, opened in 2001, combines modern conveniences and luxuries with 19th century gracious living. The large guest rooms feature spectacular views of the grounds and the mountains beyond, and the public rooms are large and welcoming. One guest favorite is the paneled library with its wood-burning fireplace. The inn has a fine dining as well as a casual restaurant, a swimming pool, and a health club and fitness room. The Biltmore Estate first welcomed guests on Christmas Eve in 1895, and the house still comes alive during the holidays. All of the 250 rooms are adorned with Christmas trees, evergreen boughs, miles of garland, and thousands of twinkling lights. The estate hosts workshops on holiday decorating as well as candlelight house tours. In addition, special holiday meals at the estate's restaurants are a Biltmore seasonal tradition. In the spring, the gardens are full of new life. Visit the Festival of Flowers in April and May for a breathtaking tour of all the natural beauty. In summer, enjoy beautiful weather and pristine sun-drenched grounds. Buying a ticket to the estate provides access for the entire day, to all aspects of the house and grounds. Ticket prices vary according to the season and day of the week (with off-season, midweek tickets being lowest in price). You can also save considerably by buying online more than seven days before your visit. High season weekend tickets cost $65 for adults, with children under the age of nine enjoying free admission, and children under sixteen paying half of the adult ticket price. In low-season, all children under 16 get in for free. Buying a pass for a second day can be added on for $10 per person, and several additional types of passes exist, such as the 12-month pass, which also offers discounts in the shops and restaurants, as well as at nearby attractions, such as Dollywood and Chimney Rock Park. Stay at the Biltmore Inn for a truly magical experience. Off-season specials and three nights for the price of two are common offers. There are also plenty of hotels in the area, and several of these have combination packages with Biltmore Estate day tickets. Select from affordable family packages and romantic getaway arrangements that reduce the cost of an unforgettable vacation. At just two blocks away, the Doubletree-Biltmore Hotel is the closest option. Within a few miles are the Crowne Plaza Resort, the Courtyard by Marriott, and the Four Points by Sheraton. Many of these have indoor and outdoor pools, as well as on-premise restaurants for your dining convenience. The Biltmore Estate website lists additional hotel options and their amenities. Tickets for the estate are available online, as well as at the gate, but don't forget the online and seven-day advance-purchase discounts. The visiting address of this gorgeous property is 1 Antler Hill Road, Asheville, North Carolina. The front gate is open from 8:30 a.m. to 6:30 p.m. during the high season, although the mansion's front door closes at 4:30 p.m. and the gardens are only open until dusk. Ticket and pass holders may enter the premises until 10:00 p.m. to visit areas of the estate that are open, such as the restaurant. A visit to the Biltmore can be anything you make of it. Bring young children for an unforgettable experience with the animals and gardens, or come on your anniversary to celebrate your love in a magical place. With its wide variety of attractions and amenities, the Biltmore Estate is a must-visit vacation destination.